Your donations pay for hundreds of important pieces of equipment every year that contribute to better patient care, faster diagnosis and more efficient treatment at Royal Jubilee, Victoria General, and Gorge Road hospitals, for the 767,000 Vancouver Island residents these hospitals serve. Each year, the Victoria Hospitals Foundation works with Island Health to determine the most urgent equipment, special projects, education and research needs in our hospitals, to provide support for all medical specialties, enhancing care for all patients throughout our hospitals. We conduct two large campaigns annually that support specific areas of care or equipment types, and reach the community in a variety of ways. Through these campaigns, we have the privilege to be stewards for our Island Health colleagues, and share the important work of caregivers in different areas of care. We are grateful for your past donations to our major campaigns. With your help, we ensure every corner of Royal Jubilee and Victoria General hospitals advance. Thanks to you, our patients can continue to receive excellent healthcare on Vancouver Island. We are a volunteer-driven organization at heart. Over 140 volunteers give their time and talent to help with our fundraising events. We appreciate the countless hours of time dedicated to our successes. As we reflect back on our past campaigns, we would like to sincerely thank the Island Health caregivers who have shared their expertise and the patients who have told their stories. Through your day-to-day experience in our hospitals and your advocacy for healthcare, you helped transform an otherwise abstract appeal into a very grounded and human story — and this is the moment when giving happens, that instant the heart and mind are mutually engaged. Thank you for so generously lending your name and voice toward continuing and improving this legacy of care. 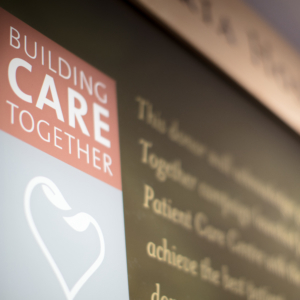 Looking back, we are profoundly grateful: for our community, our donors, our healthcare teams, our volunteers and the opportunity for our Foundation to impact so many lives with our work. Because of you, the Victoria Hospitals Foundation has raised more than $140 million to benefit our hospitals since 1989.